I have had this floral tank since 2009. Every year I decide to give it away during Spring Cleaning and every year I change my mind. It fits fine. It goes with everything and I cannot find a reason why I should not continue to keep it in my closet. So that is that. Looks like it is sticking around for another spring. That's what I love about classic printed tops which are durable enough to last after several washes. Floral is something which will never go out of trend. So is layering. So might as well invest in a few no-brainer pieces early on and then recycle them over and over again. What say? 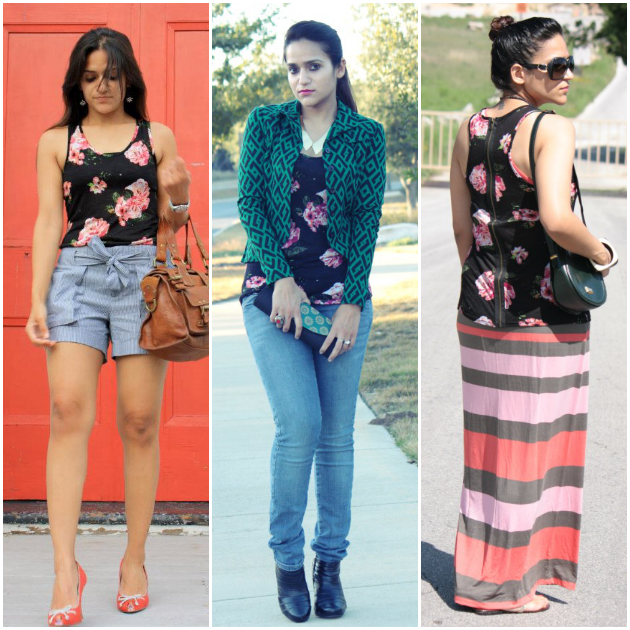 Florals are truly timeless and this tank top looks lovely in the ways you've styled it! I especially loved the third look.